Coleman Sundome 2-Person Dome Tent Just $25! Down From $56! 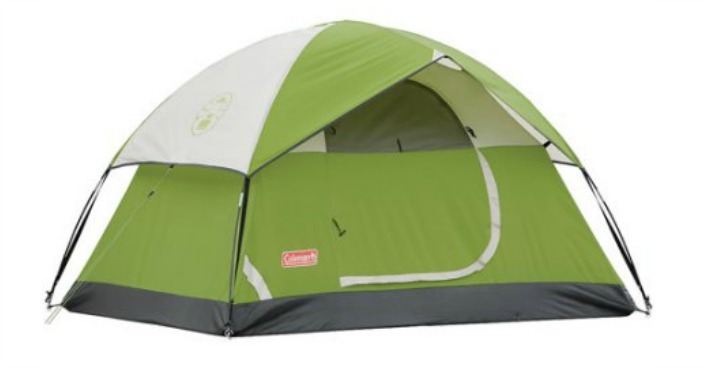 You are here: Home / Great Deals / Coleman Sundome 2-Person Dome Tent Just $25! Down From $56! Right now you can get this Coleman Sundome 2-Person Dome Tent for just $25 (Reg. $56) at Walmart! A must-have for anyone who goes on frequent camping trips, the Coleman Sundome 2-Person Dome Tent can conveniently accommodate two people at a time. Designed with the exclusive WeatherTec system, this Sundome tent keeps you safe from the elements. With leak-free seams and waterproof floors, this 2-person tent ensures to keep you dry when it rains. On the other hand, the strong, wind-responsive frame resists wind. With adjustable Variflo ventilation, this Coleman tent lets you have control over the airflow inside the tent. The vent window ensures complete privacy, whereas the door makes for convenient entry and exit. The continuous pole sleeves, InstaClip attachments, and the pin-and-ring design make it easy to set up this camping tent. The dome structure of this Coleman Sundome 2-Person Dome Tent makes for convenient portability, while enabling quick and easy setup.